Show everyone that the Blues are your team whether you're in training or at the Stadio San Paolo in this Napoli 18/19 Football T-Shirt from Kappa. 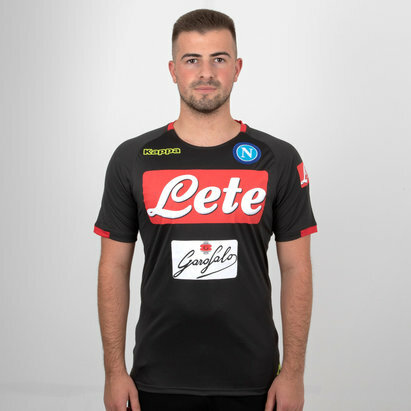 Italian Serie A side Napoli have collaborated with sports brand Kappa for a selection of striking kits this season crafted to evoke the wild. The Campania side have kept their partnership with the Italian sportswear brand since 2015 and look to be lifting silverware in the kits they have designed together this season. This t-shirt is sure to keep the wearer comfortable. Made from 60% cotton and 40% polyester this round-neck t-shirt is void of irritation. It comes in black with green sleeves and blue detailing. The Kappa logo is on the right with the club badge on the left.